In the closely-watched Montana special congressional election on Thursday, President Trump is the shadow hanging over a race that neither candidate can fully escape — even though they&apos;re trying. The contest to replace Trump&apos;s Interior secretary, former GOP Rep. Ryan Zinke, has become uncomfortably close in a state the president carried by 20 points. And while both GOP nominee Greg Gianforte and Democratic nominee Rob Quist still hew closely to local and state issues on the campaign trail — like public lands, gun rights and agricultural concerns — the charged national environment and the Republican health care bill, in particular, are playing critical roles in motivating their differing bases in the closing days. For Montana Democrats, the race is a way to send a message to Washington. "I think a lot of people that maybe had voted for Trump now look at what&apos;s happened in the next 120 some days, and maybe that might throw some people toward voting toward Rob," said Bob Church, age 72, a retired high school government teacher who came out to hear Quist on Monday evening in Great Falls. Quist, a banjo-playing folk singer who&apos;s never without his signature cowboy hat, didn&apos;t directly mention the president in his remarks. But, one of his staffers made a plea to the crowd to work to appeal to more independent-leaning Trump voters to switch to their side — particularly ones who had voted both for Trump and for Democratic Gov. Steve Bullock, who beat Gianforte by about four points last November. With "Rob you have an independent voice, you have an independent message and we work to reach all these people — the people that voted for Trump across the ticket and voted for Bullock. The people that might think, &apos;you know &apos;I feel disenfranchised, I feel left behind,&apos;" Nation Garza told the crowd. "These are the people that we&apos;ve been reaching — the independent-minded people. The people who aren&apos;t always part of the political process." That was certainly the case for Carol Boughton, age 73, a retired government scientist who had come out to volunteer for Quist. She said she&apos;s never campaigned for a candidate before or gotten involved in politics — until Trump&apos;s election pushed her over the edge. "I just got so frustrated about what was going on and is still going on there in D.C. and got tired of talking to my friends of like minds and I said I&apos;ve got to do something," Boughton said. And while Trump is certainly atop her mind as she&apos;s been out canvassing, she&apos;s perfectly fine with the fact that the president isn&apos;t being mentioned by Quist all the time. "Even [Quist] is not talking about it, a lot of the grassroots people here, they see what&apos;s going on" with the growing scandals in Trump&apos;s administration, Boughton argued. The race has certainly tightened in the final weeks, with GOP polling showing a race in the low single digits. Privately, national Democrats are a bit more skeptical of the prospect of an upset — instead looking ahead to next month&apos;s special election runoff in Georgia as their chance to send a shockwave through the political system. The terrain in the northern Atlanta suburbs that Trump barely won is better primed for a possible pickup, and that June 20 contest has gotten the bulk of outside money and national attention. Another reason for private skepticism among Democrats is that Quist has had plenty of setbacks, and he&apos;s not exactly a candidate in the mold of Bullock or Democratic Sen. Jon Tester who might be able to easily woo swaths of swing voters to his side. He&apos;s not very polished on the stump, and in recent weeks has been hammered by reports of property tax liens and unpaid debts. Quist claims some of his financial troubles stem from a botched gallbladder surgery over two decades ago, and that&apos;s a talking point that opens the window for him to talk about the GOP&apos;s health care plan to repeal and replace the Affordable Care Act. "They call it &apos;The American Health Care Act.&apos; I call it the Un-American Health Care Act," Quist told the crowd Monday night. "First of all it raises premiums on everybody by over $300 a month and bringing back the whole concept of pre-existing conditions." "My health care issues have been well-documented," Quist continued to laughter. "But you know I&apos;ve worn it like a bloody shirt, because you know when we do our health care rallies, people stand up and share their stories that are just very similar to mine. And in my view, in the world&apos;s greatest country on Earth, you shouldn&apos;t have to go bankrupt because of medical issues." Quist has gotten his own major national booster in the final stretch, with Sen. Bernie Sanders, I-Vt., hitting the trail with him this past weekend. Sanders beat Hillary Clinton in Montana during the Democratic presidential primary, and his brand of populism is what Quist hopes he can replicate in facing off against Gianforte, a multimillionaire software executive who&apos;s partly self-funding his campaign. "Rob and I are going to do everything we can to bury that horrific, disgusting piece of legislation that passed two weeks ago," Sanders told voters about the health care bill at a stop in Bozeman. Health care is the focus of Quist&apos;s final ad, and he takes aim at his GOP opponent for supporting the bill. While Gianforte initially hedged on whether he supported the House Republicans&apos; bill, the New York Times later obtained a recording of the wealthy software executive telling donors he was "thankful" for the bill. An aide later clarified he was thankful for the repeal process proceeding, and said that Gianforte wouldn&apos;t have voted for the AHCA because he didn&apos;t know the Congressional Budget Office score — which is now set to come out Wednesday, less than 24 hours before voters head to the polls. Republicans hit the panic button? Meanwhile, Republicans look like they&apos;ve begun to worry. Vice President Pence, who&apos;s already campaigned with Gianforte, just recorded a last-minute robocall for his campaign. And the president&apos;s son, Donald Trump Jr., has also come to Montana on Gianforte&apos;s behalf. That&apos;s a nearly 180-degree turn from Gianforte&apos;s gubernatorial campaign last year. He didn&apos;t appear with Trump when he campaigned in Montana ahead of the GOP primary and only reluctantly endorsed him. Now, at a Great Falls campaign stop on Tuesday, Gianforte was rattling off some of the president&apos;s signature slogans while touting his own business acumen and outsider profile. "I look forward to taking my engineering skills, my ability to do math and the ability to find common ground with people with different views to have a good outcome for both sides, back to D.C. to work with Donald Trump, to drain the swamp and make America great again," Gianforte said to applause. It was a similar message the president&apos;s son delivered earlier this month, according to Montana Public Radio. "He doesn&apos;t need this job. Just like my father didn&apos;t need this job," Trump Jr. said at a stop in Butte, a Democratic stronghold. "He wants this job because he loves this country. He wants this job because he loves this state." But that "outsider" status has also hurt Gianforte. He&apos;s not a native Montanan, though he&apos;s lived in the state almost 25 years after moving from New Jersey, and his wealth doesn&apos;t exactly give him the populist appeal Quist has. It&apos;s all the same problems back again that led him to underperform last November even as Trump rolled to an easy win. And on Tuesday, Gianforte even acknowledged to his supporters that "this race is closer than it should be." Ron Hepp, a 60-year old farmer at Gianforte&apos;s rally Tuesday, argued that the GOP candidate&apos;s positions haven&apos;t changed even if the way he talks about the now-president may have. "The opponents have put a lot of spin on Gianforte&apos;s positions," said Hepp. "He&apos;s a guy that what he says today is still good next week." Meanwhile, he painted Quist as someone that may sing a catchy tune, but ultimately would hit the wrong chord with voters. "That was fun to go there and dance and have a good time, but his opponent is the ultimate flimflam man," Hepp said, pointing to Quist&apos;s financial problems. Republicans are leaving no stone unturned to make sure that the seat stays in their column and that they avoid an embarrassing loss — with massive political reverberations — in a place that hasn&apos;t sent a Democrat to Congress in 20 years. Still, if Quist even comes close to an upset in a state that handed Trump a massive win just six months ago, it won&apos;t do much to ease GOP worries heading into Georgia next month and could only boost the growing opposition to the president. National GOP groups, including the National Republican Congressional Committee and the Congressional Leadership Fund super PAC, have spent almost $5 million against Quist to stop that scenario from happening. CLF in particular went in early to hammer the Democrat even before the race became competitive, in ads like this one, which was their closing spot. In comparison, national Democrats have spent paltry amounts on Quist&apos;s behalf. However, the Democratic nominee&apos;s campaign has seen a major uptick in contributions in the final stretch, now topping the $6 million mark, in large part thanks to small-dollar donations much like the ones that fueled Sanders&apos; campaign. Gianforte, meanwhile, has put $1 million of his own money into his campaign coffers and raised another $2.2 million. All that cash in a relatively inexpensive state has saturated the airwaves, and left many voters more than ready for Thursday&apos;s election to be done with. Away from both campaign events on Monday, Lisa Carlson, a 51-year old insurance saleswoman, was sitting in a park, complaining about her two choices. She voted for Trump, somewhat reluctantly, and is still willing to give the president the benefit of the doubt as he finds his sea legs. But on the question of Quist vs. Gianforte, she&apos;s torn. 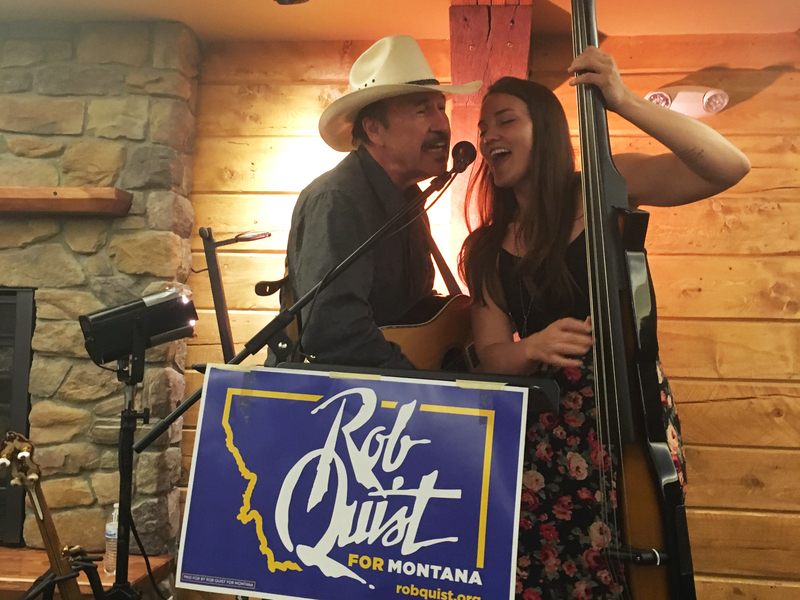 "I think that Quist is probably just not experienced enough, maybe strong enough to get in there for what he thinks is right and probably doesn&apos;t have the connections," she said. "I agree with some of the things that both of them stand for so that makes it difficult." Ultimately, Carlson said she will just be happy when the election is over. "I&apos;m half tempted to vote for the underdog just cause I don&apos;t want to vote for either of &apos;em," she sighed, taking a drag on her cigarette.